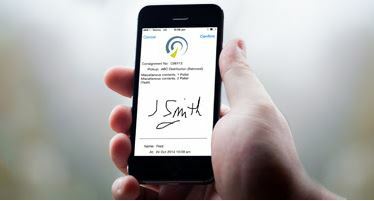 Advanced mobility features like sign-on-glass (SOG) are now available to road freight transport operators of any kind or fleet size with the Freight2020 Mobile App just released by CMS Transport Systems, Australian developers of the fully-integrated Freight2020 transport management system. The Freight2020 Mobile App is quickly accessible and easily utilised by drivers from any location on the road, or on-site with any freight customer, using any iPhone or iPad device, and soon also Android devices. “Until now, for a freight company to offer real-time electronic proof-of-delivery, each driver would need to carry a specialised device. The cost of this dedicated mobility hardware is prohibitive for many smaller organisations, and so with the competitive offer of sign-on-glass capabilities there were haves, and have-nots, with a wide gap in between,” said Grant Walmsley, general manager of CMS Transport Systems. Whilst the delivery of affordable SOG is headlining the launch of the new Freight2020 Mobile App, the app is also allowing drivers to interact with live bookings data, and helping to manage the administration of drivers and vehicles over the entire shift – from the driver’s login for start of duty hours and completion of compulsory vehicle safety and operational performance checklists, to their logout at each shift-end. “The app then requires the driver to complete a vehicle fault and safety checklist before setting out on their journey. We made this procedure very fast and user-friendly for the drivers too. Details of any fault can be reported in notes, and any photographs are uploaded easily. This information is integrated to fleet maintenance management within Freight2020, so that workshop scheduling and budgeting for repairs or parts can be done in the first instance. Where vehicle safety or performance could become at risk, issues can be addressed before they become serious or even more costly,” Grant said. Once the driver has completed the Freight2020 Mobile App’s shift-start requirements, live booking data is available to the driver on-screen, with options for viewing all manifests for the current shift, the current week, or all-time. One touch of any manifest heading opens the detailed freight booking screen, where all of the up-to-the-minute information about each booking is available to the driver. The driver can interact with the Freight2020 system booking data in real-time via pickup and delivery routines which include capturing proof-of-delivery with a signature written on the screen, just as with the more costly specialised hardware for sign-on-glass. POD evidence is then available throughout the Freight2020 system, from where notifications to freight customers can be distributed automatically. Updates to track-and-trace information are made available in real-time for instant online viewing by freight customers. Advanced features such as real-time driver location tracking, and location maps for the driver, are managed transparently by the Freight2020 Mobile App working with the drivers’ mobile device. “Each driver logs out of the Freight2020 Mobile App at the end of their shift, and end-of-shift details are made instantly available throughout the Freight2020 system, for operations management and payroll calculations,” Grant continued. “Between the core Freight2020 transport management system and the Freight2020 mobile app, CMS has provided a complete end-to-end solution for freight services delivery, operations management, administration and customer service. And as the Freight2020 Mobile App is free to download, with no specialised hardware required, implementation is extremely cost-effective,” Grant said. The Freight2020 Mobile App is available as a free download from iTunes. Anyone with an iPhone or iPad can explore the Freight2020 Mobile App’s features and functions using the “Trial Driver” setting and its pre-installed demo data to simulate interactions with checklists and bookings from the driver’s perspective. An Android version of the Freight2020 Mobile App is already being developed by CMS. Organisations already using the Freight2020 transport management system can take full advantage of the Freight2020 Mobile App immediately, and if using sub-contractors, they can have sub-contractors download and use the Freight2020 Mobile App to cover the ‘last mile’ with onforwarding. CMS credits their long-standing Freight2020 customer Asixa with inspiring the development of the Freight2020 Mobile App, and partnering in the development process including live on-the-road testing within their fleet over the period leading up to the release of the finalised app technology. “Asixa is a forward-thinking organisation and their commitment to excellence in freight services was of immense assistance in focusing and driving the development of the Freight2020 Mobile App by CMS,” said Grant. For more information about the Freight2020 Mobile App for the Freight2020 transport management system, call Freight2020 representative Peter Romana on 03 9018 7080 (direct) or email info@transportsystems.com.au.